I recently received the cookbook Kid Chef Bakes: The Kids Cookbook for Aspiring Bakers by Lisa Huff in exchange for my honest review. I liked it so much that I wanted to not only share a recipe, but also host a giveaway of the cookbook! Before I even accepted the book for review I asked whether it used a lot of processed ingredients. For example, a can of dough, a roll of pie dough, a can of filling, etc. A lot of people who create cookbooks for children like to offer them unnecessary shortcuts. And this one does not! Wonderful! A book for young bakers actually teaches them how to bake with super easy step by step instructions. The ingredients are kept simple, without extra difficult steps. My daughter is 12 now and she’s already made 5 recipes and loves it. My family has loved everything she has made: a lemon cake, blueberry peach crostatas, muffins, soft pretzels, and these buttermilk chive biscuits. The book starts off with some Kitchen Rules(e.g. having to check with a parent, wash hands, cleaning up after yourself) and then turns to simple to understand descriptions common ingredients like the difference between baking powder and baking soda. I love how it also describes utensils and appliances with little pictures next to each one to help younger bakers learn faster. It then gives baking tips like separating eggs and mixing and folding ingredients. When it comes to the recipes, my favorite part is that it is set up in a beautifully simple way to understand. Lisa Huff and the team at Callisto Media did a wonderful job. It says right away how much time it should take for prep and baking, as well as yield, lists the equipment needed, then lists ingredients and directions with bold headings for each section. If there are ingredients for a sweet bread and other ingredients for a glaze, they will be listed under separate headings. My daughter had no confusion of what to put in where. Love it! Highly recommend it. 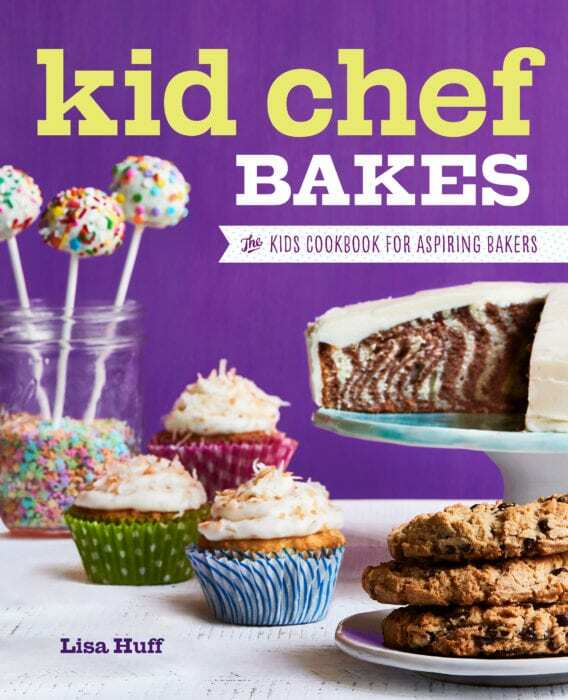 If you’d like to purchase it you can find it here: Kid Chef Bakes: The Kids Cookbook for Aspiring Bakers. I expected a baking book to have nothing but sweet ingredients. That’s not the case here at all. Kid Chef Bakes has a lot of cookies, muffins, and desserts with whole fruits, but it also has non sweet breads like white sandwich bread, these buttermilk chive biscuits, soft pretzels, and a number of lunch ideas like mini calzones, pepperoni pinwheels, and Mexican pizza. Ready for the Recipe? These Biscuits were delicious! They were moist and savory. My daughter made them while I made chicken and vegetables. They were a hit. Set the oven rack at the lowest level. Grease a cast-iron pan. In a large bowl, mix together the flour, baking powder, and salt until combined. With a pastry cutter or back of a fork, cut in the 6 tablespoons of cold butter, until the mixture resembles coarse crumbs. Stir in the chives. Add 1 cup buttermilk to the flour mixture. Stir to combine, and add more milk as necessary until the dough just comes together but is still moist. Be careful not to overwork the dough or the biscuits may come out dry. Place the dough on a floured surface. Gently press the dough until 1 inch thick. With a 2-inch round cutter, cut the dough into 16 biscuits. 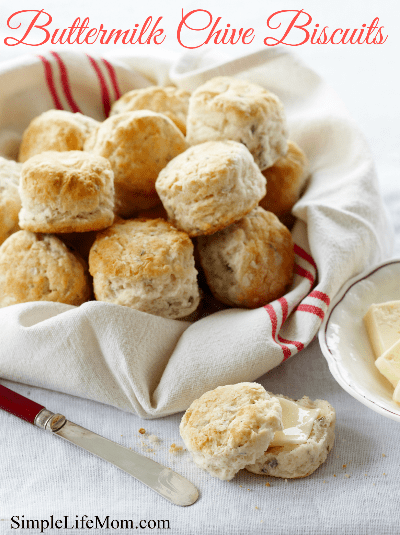 Place the biscuits next to each other in the prepared pan. Bake on the bottom rack for 12 to 17 minutes or until golden brown. Brush with the 3 tablespoons of melted butter. Cool slightly before serving. Try Instead: Instead of chives, you can use chopped cooked bacon, shredded cheese, or even chopped precooked onion. This giveaway is for one cookbook.According to the publisher’s rules, it must be to a winner in the continental United States. If you live elsewhere you can still enter and I can offer you a 50% discount on your order from my shop. Try More Real Food Recipes HERE. I have 2 12 year old granddaughters who would totally love this cookbook! Judging by how much my daughter loves it, I’m sure they would too. This book would be for my daughter. I love to bake and cook and she seems to be following in my footsteps! Thanks for the awesome giveaway! I would love to give this to my little cousin, she loves to bake and try new recipes and I think this would help encourage her! I like the variety of baking recipes throughout it. I’m sure it would be a perfect gift for a new baker (or an experienced one). I’d love to have recipes broken down into simple steps to get my kids cooking. I was really happy with how the recipes are laid out. Very easy to read. My Chloe Pearl will be turning 8 in December. She loves baking. She took a baking class earlier this year and had so much fun with it. I can not wait to show her more in the kitchen! Yes, it sounds like she would love it! This is for my 12 year old daughter who loves to cook and help in the kitchen. My daughter is around the same age. She loves it! I would love to gift this to my son who is 9 and has really gotten into helping us cook! I think he would be able to follow it really easily. I would give this to my granddaughter, she is just starting to cook. Good luck! Thanks for entering. This is for my sweet granddaughter. Wonderful! I’m sure she would enjoy it. My twin girls are both 11 so it would be for the family. We love watching the kid cooking shows together. Of course one daughter is more interested than the other. This may give them both ideas since it has such a variety of baking recipes. I would LOVE to share this with my ten year old twin nieces who enjoy baking. I think it would be a fun activity to do together! Thank you for the contest and the chance to win this wonderful book! 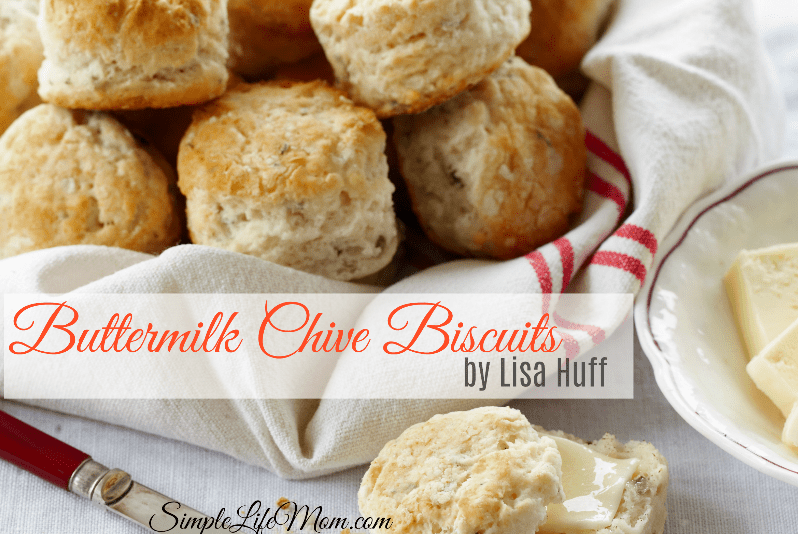 Your Buttermilk Chive Biscuits will be a big hit here at the cottage, I just pinned this one! Thanks so much for sharing your special post with us at Full Plate Thursday. Have a great weekend and come back to see us real soon!